Need to quickly knit a last-minute gift for adults or children? This is the perfect pattern. Worked in the round in a super bulky weight merino wool, these mittens are quick and easy, not to mention warm and soft. The cuff is ribbed and the hand and thumb are shaped at the top with decreases for a snug fit. 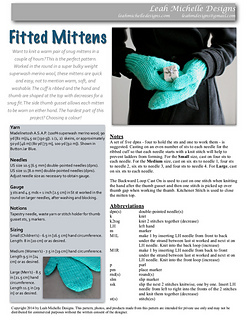 The side thumb gusset allows each mitten to be worn on either hand. The hardest part of this project? Choosing a colour! Pattern instructions are written. Yarn requirements: approximately 50 yd (46 m), 80 yd (73 m), or 100 yd (92 m) of super bulky weight yarn. Pattern is written for Madelinetosh A.S.A.P. and is shown here in Button Jar Blue. Two skeins are required for the large size, one for small or medium. And for a truly luxurious gift, choose a yarn such as Malabrigo Rasta, shown here in Zarzamora. Small (Children’s) - 6.5 in (16.5 cm) hand circumference. Length: 8 in (20 cm) or as desired. Medium (Women’s) - 7.5 in (19 cm) hand circumference. Length 9.5 in (24 cm) or as desired. Large (Men’s) - 8.5 in (21.5 cm) hand circumference. Length 11.5 in (29 in) or as desired. Skills required: knitting in the round, increasing, decreasing, picking up stitches, Backward Loop Cast On, Kitchener Stitch. Stitches used: knit, purl, M1L, M1R, ssk, k2tog. Join the Leah Michelle Designs Ravelry group for pattern support, announcements, promos, and KALs.